Chris Carter's personal involvement with farming and the landscape give him a special empathy with his native Britain. He's a genuine "son of the soil" who has worked the land for a living and who still works with some of the substance of that "land" to make his vessels. Within the many layers of his unique glazes, that are first built up and then partially taken back with abrasion and multiple firings, there is contained a search for the essence of an ancient landscape and for the shadows of its creators. These gleanings, so passionately sought, reveal themselves only gradually, like flint artefacts occasionally turned up by the plough. Chris’s work is thrown and turned with a grooved foot ring. After biscuit firing to 980°C the pieces are washed over with oxides and then glazed with anything up to seven layers of glaze before being gloss fired to 1250°C/1280°C in an electric kiln. 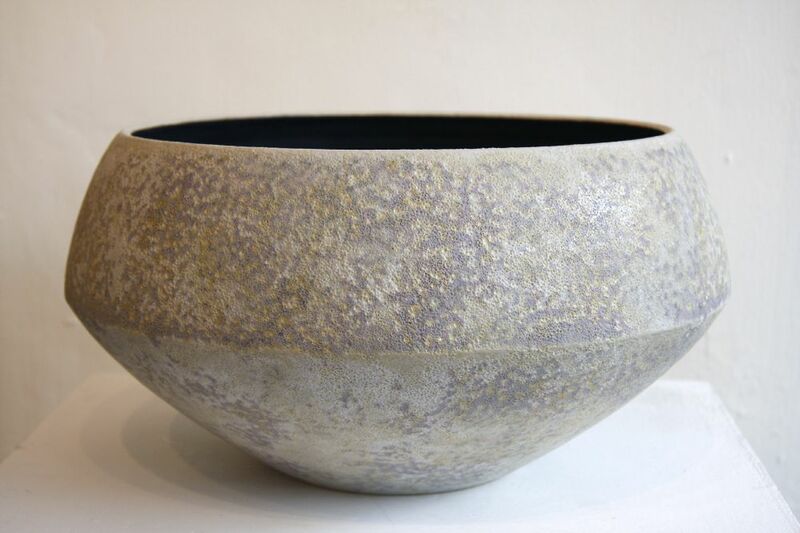 "Chris Carter is taking big steps to make pots with a new kind of strength and texture, matched by an intimate projection beyond the initial impression." Max Mayer. 1965 - 68 - Diploma in Art and Design-Ceramics, Stoke-on-Trent College of Art. Taught by Derek Emms and Geoffrey Whiting. 1968 - Began working full time at Manor House Farm, Grendon. 1971 - Set up present pottery at Highfields Farm, Grendon. 1989 - Warwick Museum. Potter in residence, St. John's House Museum, Warwick. Major Grant from West Midland Arts for the development of new forms and glaze combinations. 2001 - Gave a lecture at the Sainsbury Centre for Visual Arts, where the pots were shown in the Spring Exhibition to mark the publication of the new book about the Lisa Sainsbury Collection written by Cyril Frankel; 'Modern Pots'. Major creative ambitions award from West Midlands Arts for taking work to America and Cyprus. Given a grant from the Crafts Council for attending/lecturing at S.O.F.A. in Chicago. 2002 a disastrous fire destroyed most of my workshop. I was back in full production with a bigger kiln by Christmas. Collaborated with and influenced by farmer/archaeologist - Martin Green, painter - Brian Graham, poet, Paul Hyland and writer/publisher Vivienne Light at Down Farm, Cranborne Chase. P & O Cruise Liner 'Oriana'. Nottingham Castle Museum and Art Gallery. Feature by Kitty Corrigan - Country Living magazine. Povl Ahm, Ove Arup Partnership, London. By designer Hildegard Bechtler on her widely acclaimed set staged at the Almeida Theatre, Islington, and later at the Apollo theatre in the 'West End'. Collection of work for Solihull Council. Font for St. Martins-in-the-Delph, Stoneydelph, Staffordshire. Eigse Arts Festival, Carlow, Ireland.